It might be freezing above ground, but the temperatures down below are much more temperate. Since caves and caverns maintain steady temperatures year-round, they make a great wintertime destination. 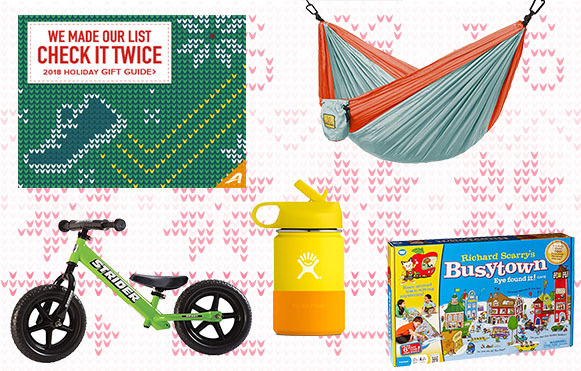 We rounded up 10 that are open during winter months and are just begging to be explored with the whole family. 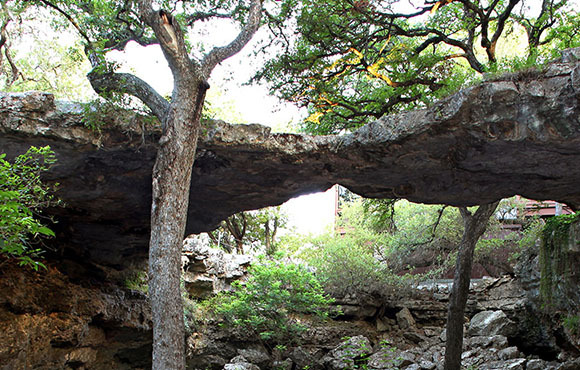 Discovered by four college students in the 1960s, Natural Bridge Caverns has since become one of the most popular natural attractions in Texas. Hidden below a stunning 60-foot limestone bridge, the caverns stretch for two miles below ground. The first half-mile encompasses the Discovery Tour, a 75-minute guided walking tour. Other tours include the Hidden Passages Tour, the Lantern Tour and the Adventure Tours (which include climbing, hiking and rappelling). But the best part of wintertime adventuring at Natural Bridge Caverns? It's always a mild 70 degrees. As the largest privately-owned show cave in California, Moaning Cavern is so big that the Statue of Liberty could fit inside! Visitors enter by descending a spiral staircase into the bottom of the chamber–for those with a more adventurous spirit, there's also an option to rappel the 165 feet to the cavern floor. If you're lucky, you'll hear the cavern make the ghostly moaning sounds for which it is named. But don't worry, there are no hauntings here (at least none we know of). The eerie sounds are caused by natural acoustics and the echoing of water dripping in the cave. Be sure to pack a jacket; the caverns are a balmy 61 degrees year-round. No list of caves and caverns is complete without Mammoth Cave–the world's largest known cave system with over 400 miles that have been explored so far. Humans first entered this cave over 4,000 years ago, and curiosity has called us back ever since. Winter is a peaceful and quiet time to visit the cave, and guided tours are offered daily. For families with small children, try the Frozen Niagara Tour. 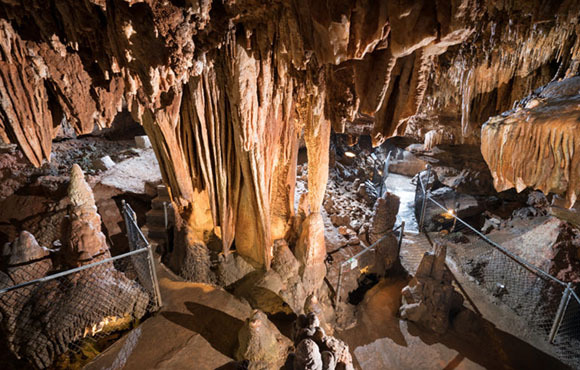 If you and your family have enough stamina, the four-hour Grand Avenue Tour (ages 6+) will give you a good feel for the size and complexity of the cave system. Dress appropriately: Temperatures in the cave hover around 54 degrees. 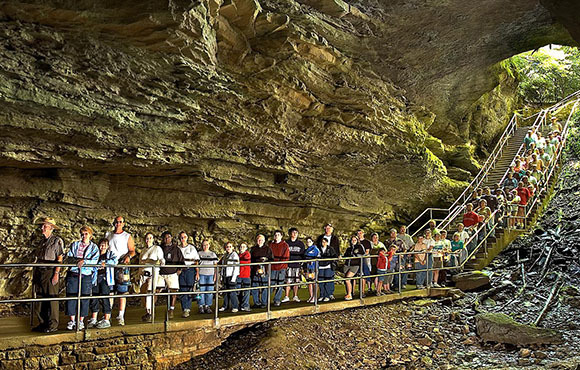 One would never guess that below the unassuming farmland of central Ohio are the state's largest caverns–over two miles long and 103 feet below ground at their deepest point. 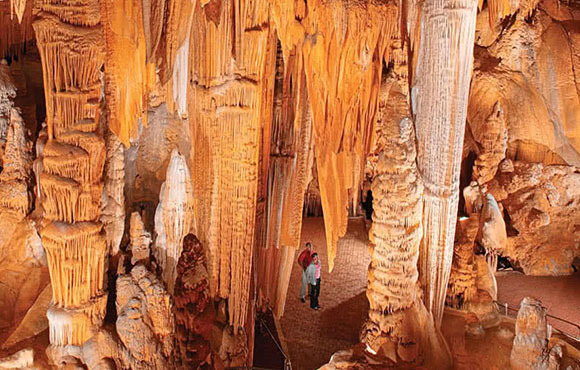 Visitors are often in awe over the jaw-dropping stalactite and stalagmite formations. The Winter Season Tour takes the curious through both the natural and historical aspects of the cavern and includes a section of the cavern not open during the summer tour. The temperature below ground in the caverns is always 54 degrees. Existing in near pristine condition, Kartchner Caverns was discovered in the 1970s and sold to the state of Arizona in 1988 as an Arizona state park. The cavern is home to one of the longest soda straw stalactites (21 feet), Arizona's tallest column (58 feet) and many other unusual formations. Tours are held year-round and are extremely popular, so tickets should be reserved in advance. The average temperature in the cave is 70 degrees. 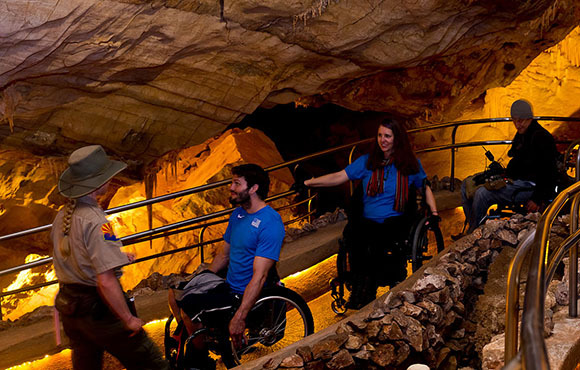 Visitors can see these caves by taking one of three tours. The Discovery Tour takes visitors through an electrically-lit portion of the cave, the Lantern Tour allows visitors to explore by candlelight and the Caving 101 tour weaves through muddy and wet passages. The temperature in the cave is a constant 54 degrees. Nicknamed the "Marble Halls of Oregon," Oregon Caves was formed by acidic water seeping into marble rock. The result is dark, snaking underground passages waiting to be explored. 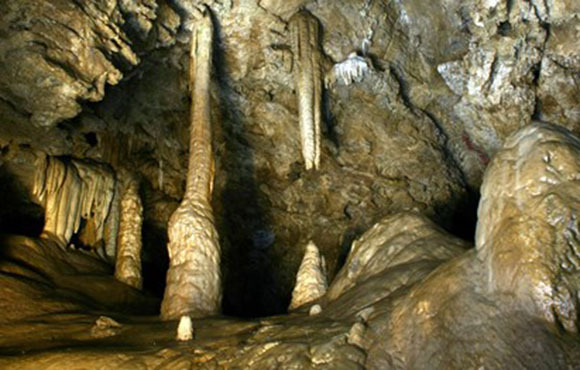 Four guided tours allow visitors to explore the Oregon Caves. 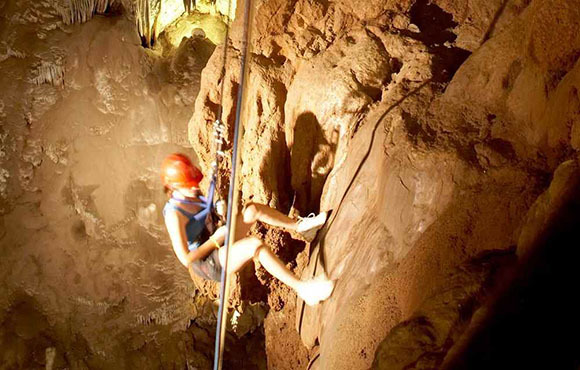 The Kids and Families Tour is great for young kids while the Off-Trail Caving Tour will quench the thirst of the thrill-seeking adventurer. Dress warmly, as the temperature inside the cave is a chilly 44 degrees at all times. Stepping into Luray Caverns feels like entering another world. Tours of this popular cavern depart every 20 minutes every day of the year and lead visitors into cathedral-sized rooms with 10-story ceilings and towering stone formations. 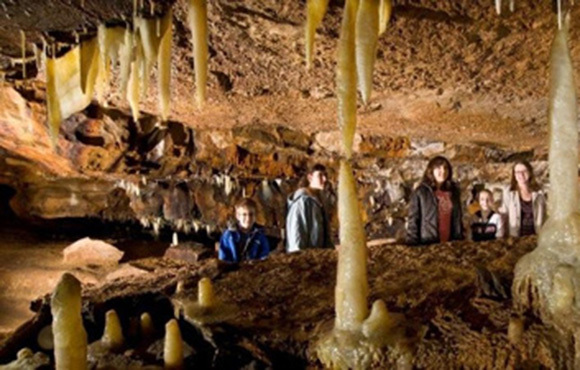 Bring a jacket to these caverns as well–the temperature remains a steady 54 degrees. 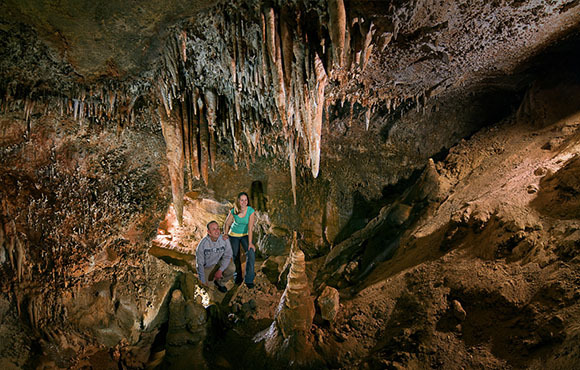 The oldest toured cave in Arkansas (it's been open to visitors since 1893), Onyx Cave is a subterranean wonder. Perfect for a family adventure, there are easy and accessible paths through the cave and a go-at-your-own-pace audio tour. The cave is small, but its formations are impressive, and the temperature underground is always a cool 57 degrees. 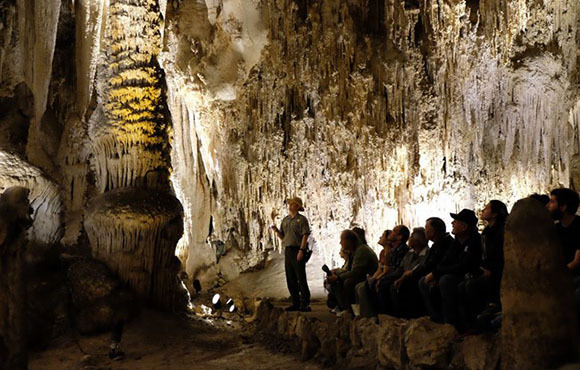 A land of underground wonders, Carlsbad Caverns National Park has more than 119 caves. Explore the cavern at your own pace in the Big Room (the single largest cave chamber by volume in North America) and on the Natural Entrance trails, or join a ranger-guided tour. Note that participation in a ranger-guided tour requires reservations at least 48 hours in advance. The year-round temperature in Carlsbad Caverns is a comfortable 56 degrees.